Laguna National Golf & Country Club’s commitment to supporting the Republic’s most talented golfers has been strengthened following a ground-breaking agreement with the Singapore Golf Association (SGA). As part of a new initiative with the SGA aimed at promoting the game and nurturing golf talent in Singapore, Laguna National – a Golf Course Facility Member of the Asian Golf Industry Federation – will provide access to the club’s facilities to members of the national amateur Elite Squad and the SGA Rookie Professional Programme. As well as being able to play the club’s two courses – Classic and Masters – at designated times, the players will also be able to make use of Laguna National’s Teaching and Practice Facility at preferential rates. Jerome Ng, General Manager at the SGA, the country’s ruling golfing body, said: “We thank Laguna National for their generosity of spirit and for all the good they do for the game in Singapore. It is great to see the golfing community in Singapore starting to all come together. 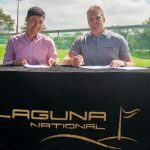 “By kindly allowing access to their courses and practice facility for our elite amateurs and rookie professionals, Laguna National will be playing an important role in their development. Kevin Kwee, Laguna’s National’s Executive Director, said: “Since its inauguration 25 years ago, Laguna National has always prided itself on making a significant contribution to golf development. “For that reason, we’re pleased to be able to offer Singapore’s most promising golfing prospects, at both amateur and professional level, the chance to hone their skills at our outstanding teaching and practice facility and on our two award-winning courses. Gregory Foo and Abdul Hadi are the latest additions to the SGA Rookie Professional Programme. The duo turned professional at the conclusion of October’s Asia-Pacific Amateur Championship. They joined Marc Ong, Joshua Shou and Jesse Yap, who were inducted into the new programme earlier this year. The SGA Rookie Professional Programme aims to provide a bridging platform for Singapore’s elite amateurs transiting into the professional ranks. One key objective is to gain entry to the golf tournament at the Olympic Games. The programme has provided support through partial financial subsidies, access to training facilities, coaching guidance and other sport-related support. 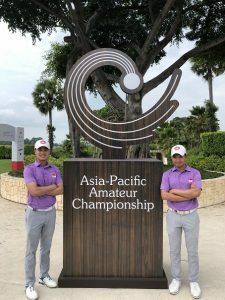 Since turning professional, Ong, Shou and Yap have been competing mainly on the PGA Tour China, Asian Development Tour and the local Singapore Professional Golfers Association circuit. Looking beyond the current scope of support in the Rookie Professional Programme, the SGA endeavours to proactively widen the support and development focus to include holistic skills development outside golf, such as personal and coaching development, tax and accounts management, social media marketing and people engagement skills. “The Rookie Professional Programme has benefitted me tremendously. Knowing that you have some support gives me a better mindset when playing events and the confidence to perform,” said Ong.